Acoustic pianos are traditional pianos that use metal strings, soundboards, and hammer to produce sound through vibration. Measurements: 36 – 40” high. Spinet pianos are the smallest of the vertical pianos and have shorter keys and drop-down actions. No modern manufacturers build spinets because the action is typically much poorer quality than other vertical pianos, though you may find inexpensive spinet used pianos. Measurements: 40 – 43” tall. These pianos also typically do not have legs, or have legs that hang freely below the keys. Measurements: 44 – 48” tall. These pianos have front legs under the keys that attach at the bottom to the frame of the piano. 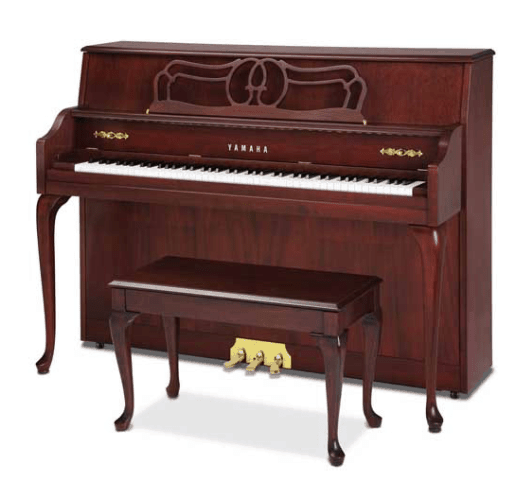 These terms are typically interchangeable for pianos 48-60”. A grand piano is based on the original design of the piano. These pianos have horizontal strings and a soundboard in a curved cabinet. 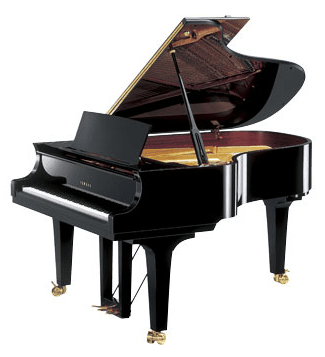 Grand pianos are supported by three legs and typically have three petals. 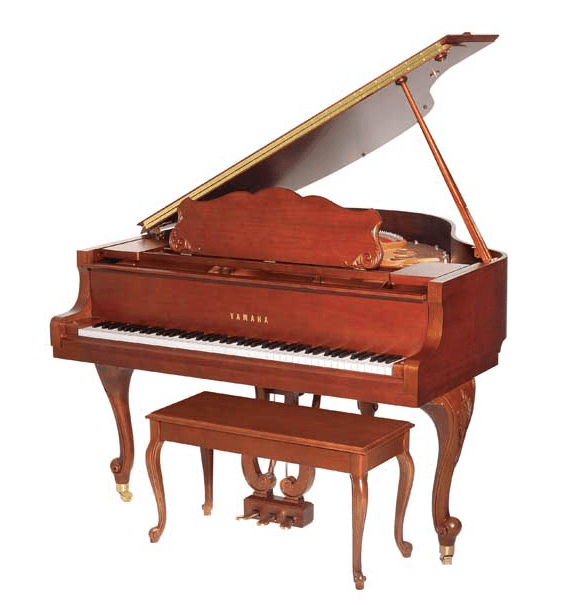 These terms are usually used for pianos 52” or taller in height. Although the tone may sometimes be better than petite baby grands, these are not technically grand pianos in any way. These are used as reinforcement of the structure in quality pianos. In grand pianos, these are found on the underside; on vertical pianos, these are found on the back. The bridge is glued directly to the soundboard and connects the strings to the soundboard. The strings produce the sound, the soundboard amplifies the sound, and the bridge connects the two. This is the exterior laminated wood built around the piano structure that gives the piano its beautiful look. Finishes typically include ebony (polished or satin), mahogany (polished or satin), cherry, white, or American walnut. Castors are the wheels on the bottom of the pianos legs to help aid in movement. Although these wheels make adjusting your piano in its space a little easier, you should always hire a professional piano mover to move your piano. These are durable wood or plastic cups that go under the castor wheels to prevent your piano from moving and to protect the floor. Bright – this usually has an emphasis in the higher tones, with a more piercing, shrill, or sharp sound. Think of it as turning up the treble in your car or home stereo. Dark – dark piano tones usually sound like a less defined, more muffled sound. Think of it as turning the bass up and turning the treble down in your car or home stereo. Warm or Deep – This is a well-balanced sound between low, mid, and high tones. Although everyone has their own taste, most pianos technicians try to achieve a deep, warm voice in pianos. Rich – You’ll hear this description a lot, especially when we’re talking about Yamaha pianos. This is typically used to describe an enhanced bass and treble tone, just like you’d realize in increasing bass and treble in your car or home stereo system. This can create a more complex and interesting sound that many musicians find pleasing. Clarity – When a piano has an excellent quality soundboard, perfectly-voiced hammers, and high-quality, even strings, it creates a purer sound. Blemishes or lower quality manufacturing can cause lost energy or distorted sound. These are pianos that do not have hammers, strings, soundboards, or plate. They use sophisticated recordings called “samples” to reproduce the sound of a traditional piano. Disklavier is a piano made by Yamaha that is a traditional acoustic piano with high-tech sensors for recording and player piano-style playback. Disklaviers also tend to have several capabilities including playing MIDI accompaniment tracks, communication with computing devices and external MIDI instruments, and internet connectivity. Since digital pianos do not have hammers or strings, pushing the keys can feel much different from playing a true acoustic piano. 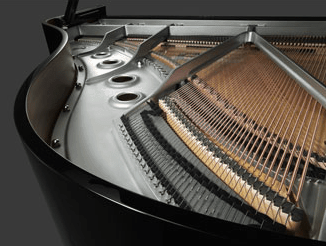 Most pianists don’t like the weightless feel of a digital piano, so many digital piano manufacturers replicate the feel of an acoustic piano in digital piano keys by using counterweights or other mechanisms. Action, piano action mechanism, or key action mechanism, refers to all the moving parts that translate depressing a key into the hammer hitting a string. The piano’s touch or “touch weight” refers to the pressure required to press a piano key. This touch should be even from key to key, and should be comfortable to the player. 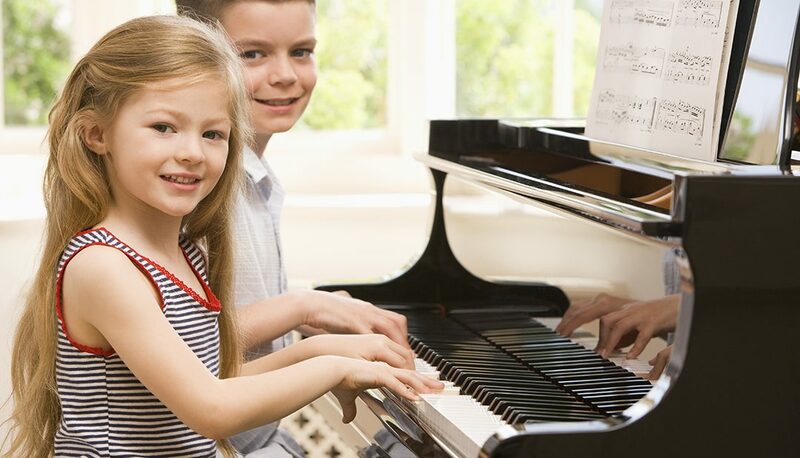 Too light of a touch will make the piano action difficult to control; too heavy of a touch will take more effort to play and make it harder to produce natural expression.